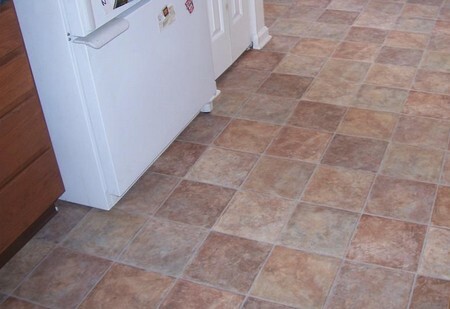 The most popular type of sheet flooring is vinyl. This is available in both solid and ‘cushioned’ versions -cushioned vinyl is more comfortable and easier to maintain, though solid types are likely to last longer. Vinyl flooring is a very practical surface as it resists stains and spillages well, is easy to brush or wipe clean and cushioned versions, in particular, effectively deaden noise. This makes it ideal for use in kitchens, bathrooms and children’s bedrooms, but modern designs make it possible to use it in any room. Some vinyls may, however, not be able to cope with a lot of ‘traffic’ and will wear quickly. Lino (linoleum), once very popular, is having something of a revival, and is now available in a wide range of styles and colours. It is warm to the touch and hardwearing, so is ideal in hallways and other areas of high traffic. If polished, it is easy to clean, so it is also suitable for kitchens. Lino, too, comes in tiles as well as sheets. However, sheet lino is difficult for the amateur to lay as it is heavier, less flexible and harder to cut than vinyl. Sheet flooring needs to be laid on a dry flat floor, which should be prepared in the same way as for laying carpet with any remedial work being carried out. On uneven timber floors, lay down hardboard sheeting; on uneven solid floors, use floor levelling compound. Vinyl sheet comes in standard width sheets -typically 2 m (6 ft 6 in), 3 m (9 ft 8 in) and 4 m (13 ft) wide – so it should be possible to order a single piece to fit most bedrooms, bathrooms and kitchens without having a seam. This will certainly look better than having a join, but it does make the sheet a little cumbersome to lay. Lino is generally 2 m (6 ft 6 in) wide. You will need to measure the room carefully, making sure that the sheet you buy is the longest length and the longest width necessary. Draw a 1:20 scale plan of your room and before taking the sheet into the room, lay it out in a larger room and draw the measurements on it allowing 100 mm (4 in) for trimming along all edges. Cut the sheet to size using scissors or a sharp trimming knife and straight-edge. Roll the sheet up to give the shortest length of roll and leave it in the room where it is to be laid for a couple of days to acclimatize. It is not easy to unroll a single piece of sheet vinyl big enough to cover the whole room on your own, so get someone to help you at this stage. Make sure the sheet is positioned the correct way round and, where there is a pattern, use the doorway as a view point to check that this looks straight. To help the vinyl sheet lay flat, make cuts at the corners and then use a broom all over the surface. Next cut the vinyl so that there is an overlap of around 50 mm at each wall for final trimming. In alcoves, make cuts parallel to the sides of the alcove and do the same for doorways. Before the final trimming, cut the vinyl once more so that there is only around 25 mm (1 in) left to trim and use a square block of timber to force the vinyl sheet into the corner between the floor and the skirting board (baseboard). Now, using a steady hand, run the trimming knife all along the join between the wall and skirting, holding the blade at an angle to the wall. Alternatively, fold the sheet back so you can mark the joining point and then cut along your marks with scissors. Cut the sheet carefully to fit around the door architrave and into the doorway, finishing off underneath the door. With ‘stay-flat’ vinyl sheets, you do not need to stick them down in any way; other types of vinyl sheet need to be glued down using a solvent-based adhesive. Cushioned vinyls need sticking down only at the edges, which simply means rolling them back, applying the adhesive and then sticking the edges down again. Solid types need gluing all over which you should do half a room at a time. Use a soft broom to press the vinyl down flat again. Fit a threshold strip across the doorway, screwing it down to the floor underneath – on solid floors, fit wallplugs into the floor to take the screws. Where you want to lay sheet flooring to fit exactly against an irregular wall surface, you can use a procedure known as ‘scribing’. For this you will want a short block of wood and a pencil. The sheet is then positioned away from the wall (by at least the size of the wood block) and the block is slid along the wall, with the pencil held against its far edge. This will reproduce the shape of the wall faithfully on the sheet so that you can get an exact fit.